Brachychiton acerifolius: No Shrinking Violet - Richard Lyons Nursery, Inc.
Australia is known for its vast array of interesting plants. Among them are 30-plus species and natural hybrids of the genus Brachychiton. Some of those species make small trees with modest floral characteristics. But B. acerifolius is decidedly not made in that mold. 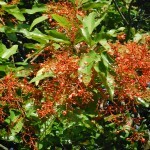 Perhaps this species’ common name––Illawarra Flame Tree––provides a clue to its flowering traits. When in bloom during the dry season, its scarlet flowers have no problem attracting attention from a distance. Often this show occurs when the tree is semi-bare; its degree of deciduousness is related to the level of winter rainfall. B. acerifolius is native along subtropical portions of Australia’s east coast from New South Wales northward into Queensland. That means, among other things, that mature specimens are normally able to tolerate temperatures down into the mid-20s. Although the species can reach significant heights in deeper soils within its native habitat, it usually tops out in the 30-35 ft. range in southern Florida. 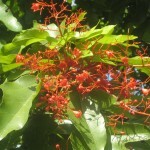 The Illawarra Flame Tree’s attributes are not confined to its flowering habits. It is not only reasonably fast-growing, but also long-lived. Specimens in Australia last for 50-150 years. Portions of its trunk remain green for a long time, and the bark finally turns light gray in later years. The foliage is also quite attractive. The species name, acerifolius, means maple-like, and, indeed, its leaves can be deeply-lobed like those of the beautiful temperate zone genus Acer. B. acerifolius should be grown in full sun in soil that drains well. Good pruning practices will reap great benefits. They include making cuts every three years to guarantee a dominant leader by eliminating competing leaders. (It is only coincidence that this sounds like the description of a political dictatorship.) It is also wise to anticipate which of the lower branches might create obstacles as the tree’s stature increases. It is better to remove such branches while their diameters are still relatively small. While this species responds well to ample moisture, once established it is drought-tolerant. To enhance blooming, use a fertilizer formulated for flowering and fruit trees, i.e., one with substantial phosphorus. 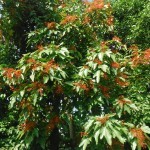 The Illawarra Flame Tree can be found at Richard Lyons’ Nursery in 15-gal. containers.